Storyboarding is an essential part of the creative process for a lot of creative sectors – not just filmmakers and animators, but also UX designers, game designers, creative directors and even teachers. Although it's an essential process, it can be excruciatingly time-consuming if you have to draw each frame or shot by hand on paper. That's why we've put together this list of the best paid and free online tools, software and apps to make storyboarding a whole lot easier and more efficient. With these tools you can import, move around and edit your original sketches (or use assets from a library if you don't have time to sketch your own) as well as adding in text, sound and script. You can even share your storyboarding progress with the rest of your team or clients either by a link or PDF format – or get instant feedback within the project. Some apps work across all devices – desktop, mobile and tablet – so you can continue working from wherever. Whether you prefer a simple tool for 2D sketches such as Make Storyboard, or a tool that allows for 3D assets like Storyboard Pro, take a look at our best options for you. Storyboarder is an entirely free and impressively extensive online tool by studio Wonder Unit. We recommend this storyboarding tool as the best free option. With Storyboarder you're not limited to inserting images and text, you can also insert an image duration, dialogue, action and extra notes. You can make edits of your sketches directly in Adobe Photoshop with one click, and export to Premiere Pro, Final Cut, Avid, or create a PDF and animated gif. To make your creative process more efficient, set yourself a timer to sketch quickly, find 3D assets by typing in a description of what you need to its 'generator' – such as 'male cautious' or 'male kneeling' – and use an array of key shortcuts. Download Storyboarder free or open source on Github. Plot is an online storyboard creator designed by an animator of seven years, Adrian Thompson, who was frustrated at how difficult it was to format and edit a basic storyboard template. You can upload your own sketches or copy assets from anywhere online to visualise ideas a lot faster. You can also insert scenes directly from your script, add actions in and invite other people to edit and make live comments on your process. Create an account to try Plot's most basic free option, or pay US$7.50/around £5.50 a month for Premium. This gives you access to unlimited projects, scenes and collaborators. Make Storyboard is a free storyboard app that can be used across all devices, including tablets and mobile phones. Using the app you can move around existing images, sketch new ideas and leave visual feedback. It's created by a team of software engineers and media creators. Differing to Boords, which just offers sharing options such as a link and as a PDF, you can directly leave comments within someone’s digital storyboard. Bear in mind this software is still in beta, so keep an eye on any updates. At the moment, Make Storyboard is completely free as its Basic and Pro versions are still in beta, but we're sure that will change soon. The Free option allows for one user, one storyboard, 10 scenes and 100 exports per month, but the Basic ups it to five storyboards and unlimited scenes and exports. The Pro version allows unlimited storyboards. Although Canva's free storyboard app for iOS and Android is targeted more at video production, it still provides animators and UX designers everything they need. You can upload sketches from your computer or straight from Facebook and edit text, add sound, save as a PDF and share a project via a URL link and by granting editing access. You can also choose from a stock library of photographs, graphics and illustrations if you don't have time to create your own. Boords is a free online tool by London animation studio Animade – designed by animators to help other animators add, remove, reorder and replace content to make a storyboard efficiently and easily. Drag and drop your files into the Boords template and share your drawing and planning sketches in PDF format or via a private link. If you have the Pro or Team version, you can all use an in-built drawing tool. Navigate through the notes field to add labels, directional notes and sound to your storyboard, re-order sketches, and share your storyboard as a link or PDF to clients or teammates with access from any device. To use Boords' most basic form it’s free (one project with two storyboards, PDF and websharing), but you can choose a Pro or Team subscription in which you add as many people as you like to one account. Read more about how to use Boords in our feature here. Boords Plus is available for US$10/£12 per month (unlimited projects and storyboards with a range of other benefits). Team costs $40/£27 per month (add as many people as you want). 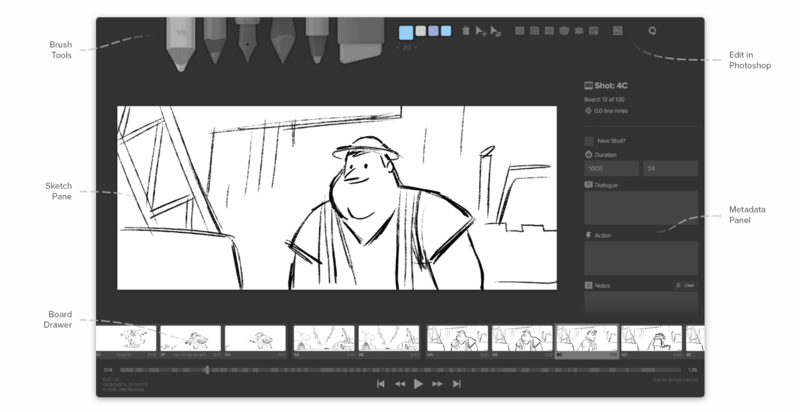 Storyboard Pro is Toon Boom's storyboard offering for directors, game designers, animators and creative directors. It stands apart from others in this list because you can import 3D models as well as 2D images in the same space. You can also split different parts of one project between team members and merge the changes back into one master project, as well as add motion layers to your panels to show camera moves. Import scripts, vector and audio formats and export layered panels to Photoshop or export your animatics to Premiere Pro or Final Cut Pro. Subscribe to Storyboard Pro for US$58/around £42 per month, or save 33 percent by subscribing annually.